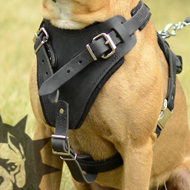 Staffy Harnesses! 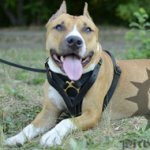 The Last Collection for Your Staffy! 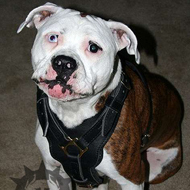 All the harnesses are designed with recommendations of professional dog trainers and vets. 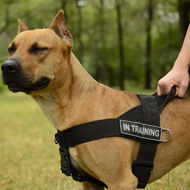 Stafford harnesses give you complete control over the dog during walking, obedience training, attack and protection work, weight pulling and sport. 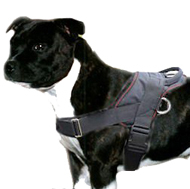 We also offer warming Stafford harnesses and rehabilitation Staffordshire Bull Terrier harnesses. Choose EMS-Express shipping (3-6 business days) or Registered shipping (6-12 business days). If something is wrong with your purchase or you have questions, tell us and we will find the way to fix a problem. We are open for dialog. 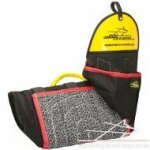 See shipping and returns page for details. We have special discounts and proposals for our loyal, wholesale customers and resellers. 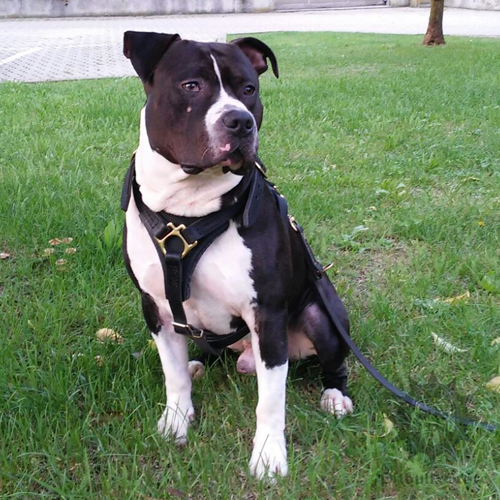 You will get the most suitable harness, which is chosen according to your Staffy sizes. Bulk customers can test our products after order payment. 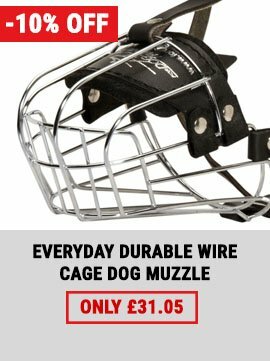 Tasty Offer for Staffy Owners! 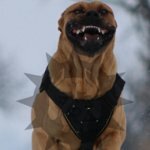 Only today visitors of this page get 10% discount for all dog supplies aside from bite sleeves and bite suits. 7788 is a coupon code! Check the coupon availability. 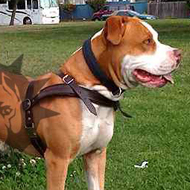 Staffordshire Terrier, English Staffy & Amstaff have become the most popular dog breeds in the United Kingdom. They are perfect companions and family dogs. 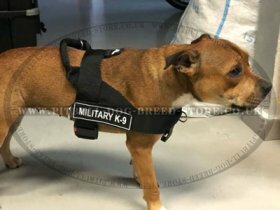 Staffy is a very strong, sturdy build and active dog, many of them take part in various championships, dog competitions and also are trained for police, K9 and service work. 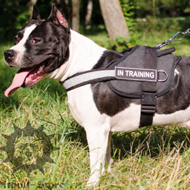 That`s why Staffy needs a specific dog equipment of a high durability and everlasting quality to make a dog training effective and successful. 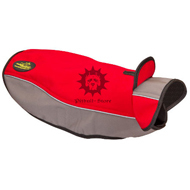 Our company produces such a purpose-designed dog training equipment as Staffordshire harnesses. 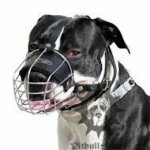 So here, in our online pet store you can see and choose the best Staffordshire Bull Terrier Harness for your vigorous pet. 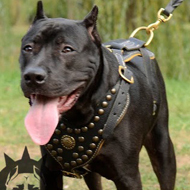 We can offer you Amstaff leather harnesses, nylon harnesses, padded harnesses for walking, training, tracking, pulling, agitation/protection, dog competitions/championships and other activities of your pet. 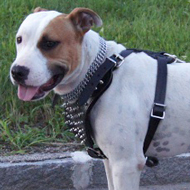 All our Staffy leather harnesses are padded and made of high-grade genuine leather. 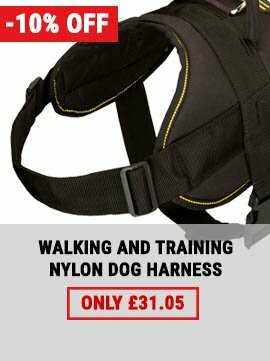 Nylon harnesses are made of a heavy-duty water-resistant material, so you can walk or train your Stafford in any weather! 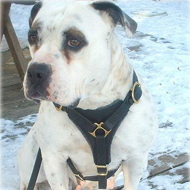 All metal fittings are are durable, rustproof and absolutely safe for Stafford`s health. 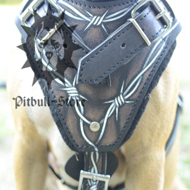 When you see the silver coloured metal fittings on Staffie harnesses - they are made of nickel-plated steel or stainless steel. And when you see golden spikes, studs and metal buckles - they are made of brass. 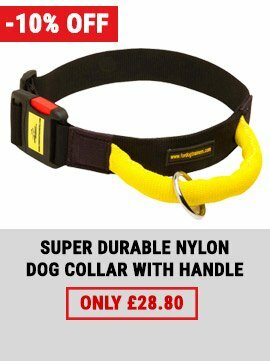 You can also find in our pet supermarket leather and nylon harnesses suitable for pulling and tracking. 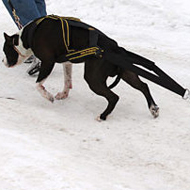 Some Staffordshire Bull Terrier harnesses are the best for mantrailing and cani cross. 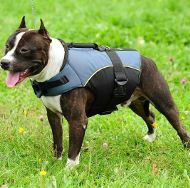 We can give you the best reccomendation for any sport type harness and for any Staffie harness that you need for any purpose. 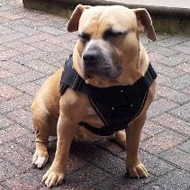 Choose a premium quality and cheap Staffy harness! 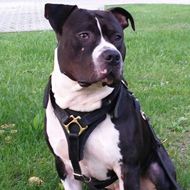 We also have a great database of Staffordshire Terrier breeders in British counties - you will find the alphabetical pages in the bottom of any webpage on the left website box. Here are the first Staffy breeders. This is top quality crafting took a while to get back but worth every penny towards it and the wait :) thanks a lot for the service as well with the tracking of the product ETC .